Are you a user of the SARAHAH app? Well, this is for you. Sarahah is one of the hottest apps for iphone and android users. The recently launched app has seen an exponential growth in the last couple of weeks, surpassing over 18 million users. Sarahah app allows its users to sign up and receive anonymous, honest messages from other users on the platform but as it turns out the anonymous feedback is not as private as we thought. According to security analyst Zachary Julian, the app is silently uploading the users’ phone contacts to the company server. If you’re wondering how this is possible then let me explain this further; once the user installs the app, it collects all the phone numbers and email addresses available on the devices. According to Zain Al-Albidin Tawfiq, the developer of the app, he responded saying that indeed the app has been collecting the information and sending it to the company servers for a new feature called “find your friend” that will be introduced in the coming days. Zain assured users that the feature will however be removed in the upcoming update. Sarahah became the third most downloaded free app on iPhones and iPads. 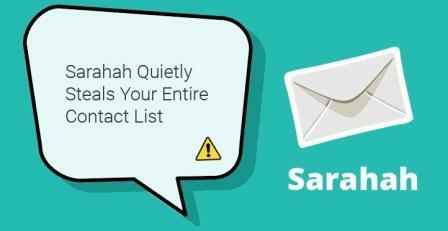 Since android 6.0 and later versions allows you to limit permissions to apps, you can still use Sarahah but block the app from accessing your contacts.